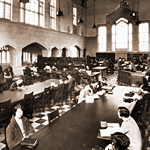 Enquiries about student enrolment numbers are amongst the most frequently asked questions in the University Archives. As a consequence, we have compiled the yearly enrolment figures presented here in chart form. More detailed information (i.e. break-down by faculties) appears in the calendars which are available in the Archives. The numbers appearing in the “Total” category generally reflect enrolment for the Winter (September-April) session. For approximately the first decade of the University’s existence the “Other” figure represents individuals enroled in short courses. Later the category includes individuals participating in Summer Session (until 2006/07), Extra-Sessional Studies, Correspondence Courses, Intersession, Guided Independent Study, and Spring Session.